The last weeks have felt very normal. That is a refreshing thing to say. It hasn't been particularly easy as all 3 of us have been fighting a nasty virus. For me that means a ton of asthma which has yet to improve. Noah pulled through a tough week last week where he hardly slept, coughed constantly and was a bear of a personality. He is definitely feeling better which is such a blessing. We bought a new home and sold our current house in a matter of a week. That's a normal thing to do. Noah is completely off night feeds. Well, that's like most 14 month olds. Normal. I found a wonderful young lady to help me in May and June when the new baby arrives. Normal. Noah sits in his high chair for every feed. Normal. He watches tv and plays with food. Semi-normal :-) He is very vocal and demanding. That's normal, right? He is taking one nap everyday, going to sleep each time. It depends on his coughing when he'll wake up, anywhere from 20 minutes to 2.5 hours. As my pregnancy progresses, I'm enjoying this quiet time in the afternoon. I know it will be short lived with the arrival of a newborn. So I'm savoring the quiet. Noah's trial with asthma meds seems to have little results - that's a good thing! We'll keep trying the mild steroid 2x a day and report back to his Ped. in a few weeks. We'll see what comes after that. That being said, today with the help of our OT, PT, SP and Dietitian, we've decided to stay the course with Noah for the time being. He is taking his Pediasure feeds very well. His retching is still difficult and frequent, but it certainly isn't worse. That's huge! With moving in 6 weeks and baby in May, there are a lot of transitions for Noah coming up. I am feeling strongly about reducing tube feeds in the next 6 months but I know that timing is huge. Our team recognizes that Jared and I do not feel a slow reduction in feeds will work for Noah. We've tried it last March and Noah began to reject the bottle even though his feeds were reduced for over a week. Now that he is off the night feeds, he has 12-14 hours off feed and he is absolutely not interested in eating or drinking in the morning. That isn't enough of a gap to develop his hunger. My thinking is perhaps we can see how Noah is doing with his weight in August and following. Praise God that Noah is growing really well and is 22 pounds. I share that with the hopes that no one will compare other kids' weights to his. That has been really frustrating in the past, especially since Noah's unique needs are not the same as a typical eater. Noah is responding to his diet and that is all that matters! Minigo! Our new "favourite food" - he loves to play with the gooey stuff and make a big mess! We have been told time and time that our respectful approach to Noah's cues is paying off. The gains are hard to measure, but there is change. It isn't a battle zone, it is simply food and positive experiences with playing. My goals with each tube feed and oral experience is to wait, watch and wonder at what Noah might do! Now when he finds a piece of something on the floor he'll give it a try. Noah's "trying" sometimes is as simple as putting it to his outer cheek and pretending to chew. It is adorable. But he is happy around food. I feel blessed to be a part of his journey. So, we keep on truckin' and now add packing up our house to the list! 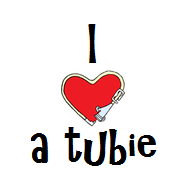 Just a note: Tube Feeding Awareness Week is February 6-12. There is a facebook page you can check out (search Feeding Tube Awareness) or check out the following website. I've outlined some of the information that is being shared to try and build knowledge and acceptance of tube feeding. We are so thankful that we have this technology to keep our son Noah alive, growing and developing as well as he is! The general public is not likely to associate tube feeding with infants and children. Moreover, they are not likely to think of children who often look otherwise healthy as having a need for tube feeding. Given the rarity of tube feeding, conditions our children have and the human interest aspect of families who go through great lengths to keep their children healthy, our children can be of interest. - The overall objective of Feeding Tube Awareness Week is to help raise awareness of enteral feeding as a positive and often life saving medical intervention for those who are unable to eat and drink enough on their own to sustain life, grown and thrive. * Feeding Tube Awareness is a group of parents of infants and children who are tube fed. The mission is to share parent knowledge of day-to-day life of tube feeding that medical professionals are often unable to provide. * There are myriad medical conditions which impair an infant or child’s ability to eat or drink enough to sustain life, grow and thrive. * Parents of tube fed children are often thought of as not trying hard enough to feed their children, when often we have tried everything. * The most basic of instincts is to eat and to feed your child. When a child is tube fed, parents often feel like failures for not being able to nourish their child. Moreover, medical complications can be a challenge to navigate making it even harder on parents.